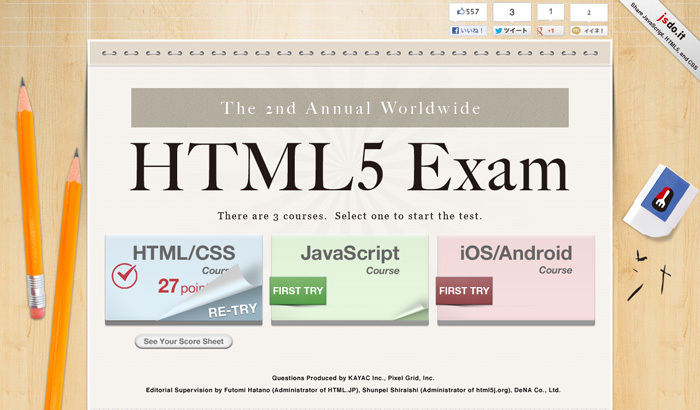 KAYAC Inc. released “The 2nd Annual Worldwide HTML5 Exam”, an online test to measure HTML5 coding skills on browsers. In this free exam, users can check their skills while aiming to be ranked high in the worldwide ranking. “The 2nd Annual Worldwide HTML5 Exam” has been implemented in cooperation with DeNA Co., Ltd., Microsoft Japan Co., Ltd., and Google Japan Inc. The first exam was held September 2012, and over 10,000 people took it. Questions Produced by KAYAC Inc., Pixel Grid, Inc.
Editorial Supervision by Futomi Hatano (Administrator of HTML.JP), Shunpei Shiraishi (Administrator of html5j.org), DeNA Co., Ltd.
jsdo.it now supports CoffeeScript and JSX!